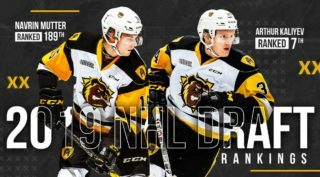 The Hamilton Bulldogs are one win away from their first ever OHL playoff series win thanks to a 5-2 victory in Game 4 Wednesday night in Ottawa. 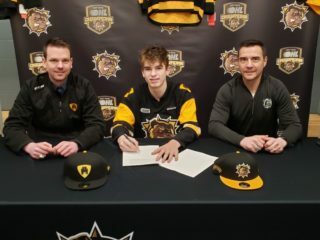 The Ottawa 67’s were the better team early on putting plenty of pressure on the Bulldogs, but goalie Kaden Fulcher was on his game and shut the door. Ottawa did get a power-play mid-way through the 1st period and it resulted in the home team taking a 1-0 lead at the 11:49 mark. However, it took the Bulldogs just 48-seconds to respond as Nicolas Mattinen (1) got a low shot through to tie the game 1-1. 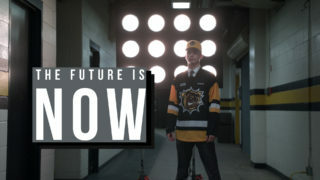 Hamilton’s power-play then connected at 17:55 as Brandon Saigeon (6) took a perfect pass and made no mistake to give the Black and Gold a 2-1 lead. The Bulldogs came out flying in the 2nd period as Robert Thomas (3) buried one from the slot at 6:24 followed 28-seconds later by Mattinen’s (2) second of the night that made it 4-1 Hamilton. The 67’s got one back, but they still trailed by two at the end of two. The Bulldogs shut Ottawa down in the 3rd period holding them to just six shots on net and a goal from Ryan Moore (2) made it 5-2 putting an end to any hopes of a 67’s come back. 67’s goal scorers were Sam Bitten (3) and Tye Felhaber (1). 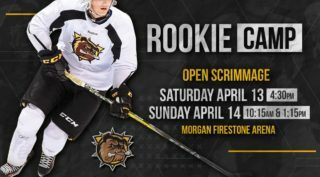 The Bulldogs can win their first ever OHL playoff series as Game 5 goes Friday night at FirstOntario Centre at 7 pm.